The SILVER SURFER bursts onto the scene, sending the men spinning into the snow. SURFER: HUMANS AGAIN! Infamous race that thinks only of DEATH and DESTRUCTION! SURFER: Will I NEVER be FREE of your INSANE VIOLENCE? CLOSE-UP on DRACO instructing the DOOMBOTS to fire. The DOOMBOTS let out a volley of electric fire. The SURFER easily avoids the fire. The LACKEY observes the scene in dismay. LACKEY: He's TOO FAST! I knew this would happen! We're LOST NOW! CLOSE-UP on the SURFER's face, expressing his rage. SURFER: So I'll have DONE with REASON, and with LOVE, or MERCY! SURFER(CONT): To YOU, they are only WORDS -- to be uttered and IGNORED! 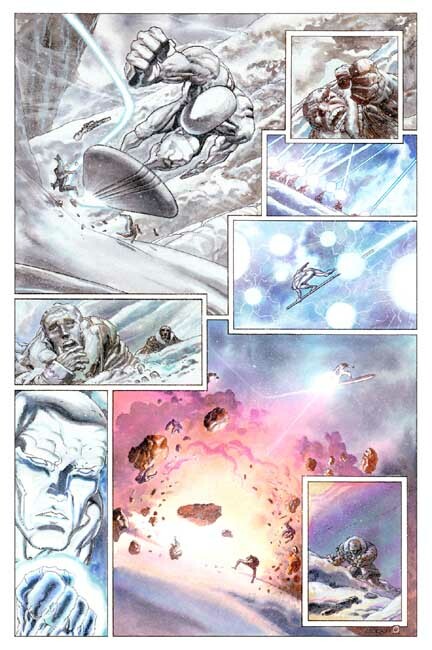 WIDE ANGLE of the SURFER shooting cosmic bolts at the DOOMBOTS, blowing up chunks of ice, scatterring them like pins. SURFER(CONT): I'll FORGET my heritage -- BLOT OUT my space-born ETHIC! CLOSE-UP on DRACO, trying to grab hold of the gun that he shot before and which is now lying in the snow not too far away.